Understanding one piece requires knowledge of the much larger segment if not the entire system, as the arrows try to indicate. Systems Analysts recognize the challenge because it is a systems diagram. They developed their expertize to deal with real world problems of interrelationships and interconnectivity. 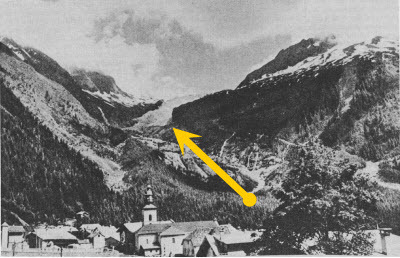 Alan Robock prepared an updated version in 1985, adding three new elements: vegetation, thermal inertia and meltwater. Tim's article is an example of cherry-picking. He favours the diagram from 1974 but rejects the science. Here is some more from the paper, which has to include as good a prediction of the present as you're likely to find more than forty years ago in the early 1970s. Estimates of the effect on climate of the increase in carbon dioxide expected by A.D. 2000 depend somewhat on the assumptions that are made about the other adjustments that the climate system will make to compensate for the increased absorption of infrared radiation. (For example, how much more water vapor will be taken up by a warmer lower atmosphere?) However, 0.5°C seems to be a reasonable first order estimate for the average rise in the temperature of the lower atmosphere due to a 20 to 25 percent increase in atmospheric carbon dioxide. We believe there will be relatively less change at low latitudes and perhaps twice the average change (or more) in polar regions, as calculated by Manabe [discussed in (18)]. 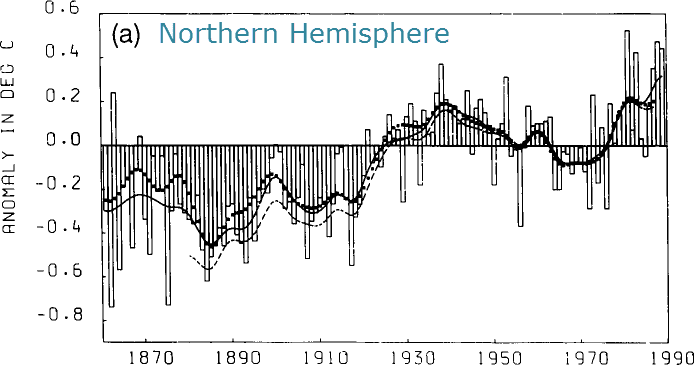 For perspective, it is helpful to note that 0.5°C is approximately the magnitude of surface temperature warming experienced by the Northern Hemisphere between about 1900 and 1945. 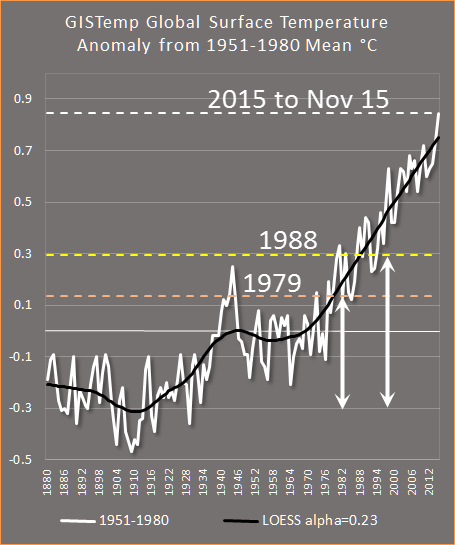 This seemingly small increase can still produce dramatic changes in some places (compare Fig. 3 with the cover photograph). Thus, anthropogenic carbon dioxide increases projected to the year 2000 could be as influential in changing the climate as the processes active in the climatic system in the first half of this century. If this increase continues until the atmospheric carbon dioxide doubles by about A.D. 2040 (11), it is doubtful that the present boundaries of glaciation or sea level will be maintained. In 1974 there was scant information about atmospheric composition and global mean surface temperature compared to now. It wasn't until 1978, four years later, that scientists at the Climatic Research Unit in East Anglia embarked on production of the world's land-based, gridded temperature data set. Around the same time, other scientists in Russia and the USA were also working on preparing a global temperature data set. The first IPCC report in 1990 cited instrumental records from three scientific groups: from James Hansen and Sergej Lebedeff in 1987 and 1988 (NASA), Phil Jones et al in 1986 (CRU), Phil Jones in 1988, and Konstantin Vinnikov (1987 and 1990), who at the time was with the State Hydrological Institute in Leningrad. 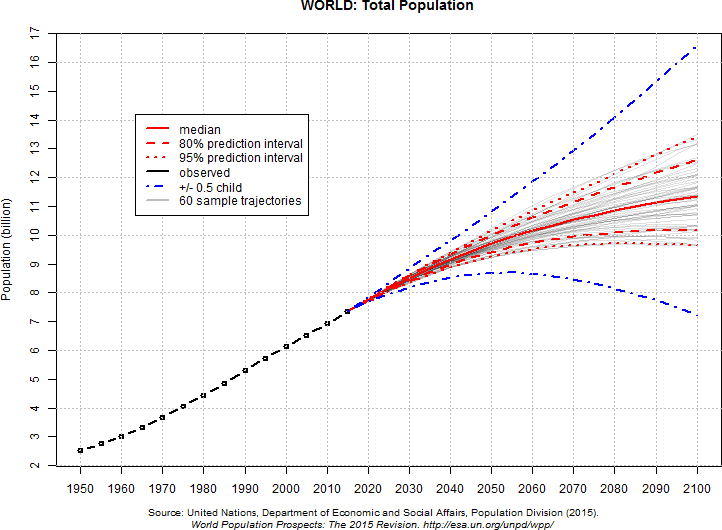 The IPCC report wrote extensively about this work, including caveats, such as gaps in the data. While there were differences between the three versions, they were highly correlated. Below are the charts from the very first IPCC report in 1990, which I've labeled. I think they are of land surface temperatures only. Way back in 1974, Kellog and Schneider wrote how "0.5°C seems to be a reasonable first order estimate for the average rise in the temperature of the lower atmosphere due to a 20 to 25 percent increase in atmospheric carbon dioxide". They didn't have anything like the observational data available today. 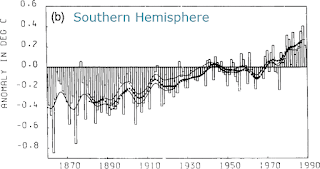 However the chart below from GISTemp, shows the rise in global mean surface temperature coinciding with an increase of 20% (1979) to 25% (1988) increase in CO2. Amended - Prompted by KAP I've changed the chart to use LOESS smoothing instead of a centred running mean. 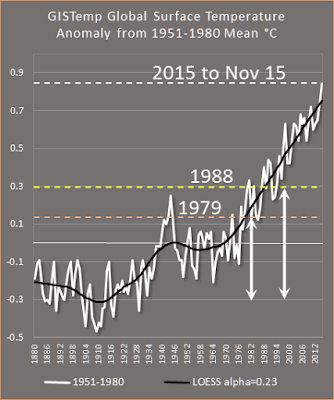 Again, say the pre-industrial mean is around 0.3 C below the 1951-1980 mean. The global mean surface temperature in 1979 (CO2 at 20% above pre-industrial) was 0.44 C above, while by 1988 (CO2 25% above) it was around 0.59 C above. That compares with Kellog and Schneider's rise of 0.5 C with a 20% to 25% increase in CO2. Not bad for an estimate made in 1974. The technique of selecting the appropriate grid size, time step, parameterization schemes, and even approximations to the basic equations is the art of modeling, and the particular choice of these elements defines the climate model. Their description covered simple models through to global circulation models, stating: "Models that include many coupled processes have been developed, but as the number of processes included and the spatial and temporal resolution are increased, so is the computation time drastically." They posed searching questions about the future, speculating about prospects for the end of this century: "Twenty billion people, each of whom uses four times the present U.S. per capita power consumption of 10 kilowatts, would require 8 x 105 gigawatts, and this is about 1 percent of the total solar power absorbed at the surface." Current USA per capita energy consumption is listed at 4.3 kW on Wikipedia, compared to the 2.5 10 kW estimated by Kellog on Schneider for 1974, so we are well on the way to a fourfold increase. [Note: I misread what they wrote. The difference could down to an economic shift from manufacturing to the service sector, greater energy efficiency, or something else. I really don't know. Sou - a bit later.] 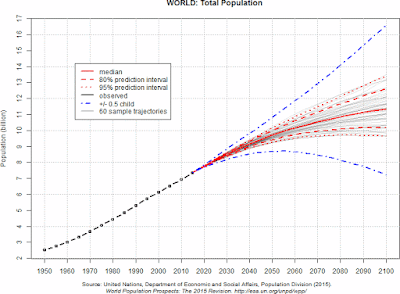 Their population projections these days would be considered above the very high end, thanks to medical advances, education and family planning programs in more recent decades. Nevertheless, given the world situation and the information available back in 1974, Kellog and Schneider were remarkably accurate and prescient. It's quite remarkable that back in 1974 they were addressing in considerable detail the same issues that the best minds of today are still grappling with, and coming to very similar conclusions, forty two years on. They discuss the impact of increasing greenhouse gases, the impact of aerosols (remember this was 1974, before clean energy regulations substantially reduced smog). They devoted a lot of their paper to geoengineering solutions and the risks they would entail. They argued against these because of the unknown consequences. They also devoted a lot of the paper to discussing vexing problems such as how to take a globally equitable and responsible approach to minimise climate change (to maintaining a climate status quo), given there will be winners and losers from both a climate perspective and an economic perspective. What is perhaps even more remarkable, is that despite the fact that for more than forty years, scientists such as William Kellog and Stephen Schneider have been writing accurate and detailed descriptions of what we are doing to the planet, there remain so many people who not only don't know what's happening, they actively reject the huge amount of confirming evidence that the scientists are correct. There are still bloggers like Anthony Watts, Tim Ball and Judith Curry and others, who indulge in crazy conspiracy theories. There are still people who make it their life's mission to make climate change worse as quickly as their thick digits can bash on their keyboards. The mass of the solar wind hitting the magnetosphere is like that of a couple of turkeys hitting per second. This will have no measurable effect, even is you increase the pressure by an order of magnitude. Put another way: the solar wind pressure is 10-100 trillion times weaker than atmospheric pressure. I didn't bother with most of Tim's article. I get the impression from skimming it that he's postulating that ENSO events are caused by magnetism, or some such nonsense. His articles are not worth the time taken to read them. Of course, the comments under Tim's article aren't worth the time taken to read them, either. Apart from them providing material for students of psychology, the only value they have is in keeping up with the latest disinformation tactic and conspiracy nuttery that Anthony Watts' fans indulge in. People were spouting their own unique "theories" of one thing or another. Here is a sample of random "thoughts". How did we ever experience droughts and floods before the El Nino effect came along? El Nino is obviously not a Liberal. 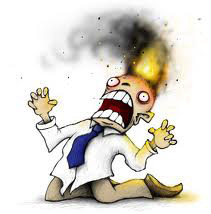 It doesn’t follow their leftist global warming agenda… as a matter of fact, it seems to have a “mind of it’s own!” LOL! This is another wonderful essay by Dr. Ball. ntesdorf is nuts. There's no other word for it. Spot on, Leigh. We all agree. The BOM regularly announces maximum temperature in Australia in summer which are 3 degrees above what actually occurs. People remember the prediction but do not check reality, afterwards. Later, as you say, the BOM splits the difference and up goes the record 1-1.5 degrees. Without UHI, Stevenson Screens in carparks, and the ‘adjustments’, we would be seeing a slow temperature drop towards an Ice Age, which should really worry us. The liberal elite’s socialist goal is to reduce the Human population, not help it in any way !! They have absolutely no interest in the weather, but all your other points are dead on ! The solar cycle of the sun is 65.7 earth years. Comprising three 21.92 year sun spot cycles of roughly 11 years positive and 11 years of negative stronger intentensive spots. The over all climate cycle is 789 years to repeat again. As witnessed in population movements to obtain favorable climates for food production over the past 5,000 years. I.e. northern europe. No, there is no evidence that the 6 cycles in each 66-year interval are related in any physical way. Jones, P. D., S. C. B. Raper, and T. M. L. Wigley. 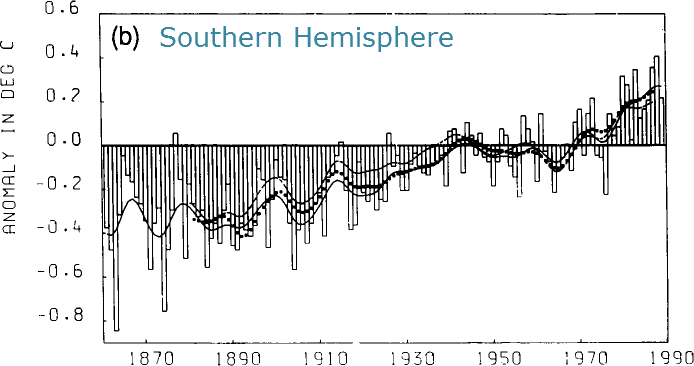 "Southern Hemisphere surface air temperature variations: 1851-1984." Journal of Climate and Applied Meteorology 25, no. 9 (1986): 1213-1230. K. Ya Vinnikov, P. Ya Groisman, and K. M. Lugina, 1990: "Empirical Data on Contemporary Global Climate Changes (Temperature and Precipitation)." J. Climate, 3, 662–677. Vinnikov, K. Y., P. Y. Groisman, K. M. Lugina, and A. A. Golubev, 1987: "The mean surface air temperature variations in the Northern Hemisphere over 1841-1985." Meteor. Hydro/., No. I, 45-55 (in Russian). Old newspaper articles from Australia, at HotWhopper, including an article from 1884 about how "A few hundredths of carbonic acid gas in the atmosphere...the surface...would become like a vast orchid house". That was in the public arena 132 years ago, and still deniers at WUWT don't get it. The stupid it burns! You obviously don't read WUWT carefully enough!!! Tim Ball has his memes in a tangle. 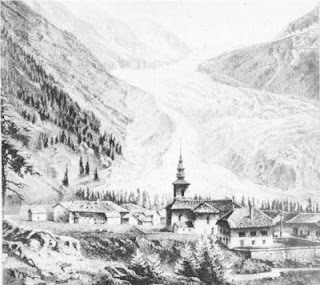 Small correction: it's the glacier and village of Argentière in France, not far from the Swiss border. Thanks Magma. I meant to check that and forgot. I even copied and pasted the correct location under the photos - silly me. Fixed now. Found a more recent picture of the village and glacier, it is now only just visible at the crest of the valley as highlighted by the red outline. FYI, instead of using an 11-year centered running mean, a LOESS smooth with α=.14 gives an almost identical result, but carries the smooth all the way to the ends of the dataset. You can get LOESS smoothing as an Excel plugin with a Google search. Thanks for the prompting, KAP. Something I should have done a long time ago. I've amended the chart and the text. Solar magnetism must be a trending meme on the climate science denier side. I've been having a discussion with a guy on another forum (/.) who is claiming climate change is all because of solar magnetism affecting clouds. I haven't been able to find a good refutation of it yet. Try the Laschamp event ~40,000 years ago. Be10 isotope levels indicate a massive change in cosmic ray impacts, but the paleoclimate record shows no significant shift. Before you can refute something, you need more than a mere assertion to refute. I know of no general peer reviewed demonstration of the notion in the first place. So there is literally nothing to refute. That said, there must have been some mention of the notion in denier blogs as I've seen comments to the same effect in various places.